The end of NaNoWriMo is upon me, which is good and bad. It’s good because I won’t have to feel the pressure of the 50,000 word count weighing on my shoulders, but it’s bad because I won’t have that pressure forcing me to write everyday. Without the deadline, I fear my writing life will go back to its sluggish pre-NaNoWriMo days. But that’s a worry for another day. For today, let’s talk about endings, and not the end of NaNoWriMo, but the end of my story. Endings are inevitable. As a reader, you should see them coming from a safe distance and be safely eased into them by the author. Book endings shouldn’t fall on you like a surprise break-up. You should be able to sense the end is near. When I read Raymond Carver’s biography this summer, I knew what the end of the book meant: the death of Carver. Biographer Carol Sklenicka eased me into Carver’s death by slowly building the final scenes, developing his illness and final months, and hinting to the end with chapter titles. Even so, I still sobbed through the final chapter because knowing the end of a book is coming is very different from actually reading that end. Obviously, your reader will know the end is coming just by looking at how many pages are left. The reader has a visual cue that the end is near, which means you better have done your job and created a successful ending. What makes a successful ending is up for debate. For some it may mean a wrap-up of events and your characters’ lives, complete with a bow on top. Others may prefer a more vague ending. Every story requires its own kind of ending. In Elissa Schappell’s essay, “Endings: Parting is Such Sweet Sorrow,” Schappell gives a crash course in the many types of endings a writer may choose from. There’s the “Doogie Howser ending” in which the narrator wraps up the story by sharing what valuable lesson they’ve learned from their experience. There are sad endings and there are happy endings, but whichever a writer chooses, the endings must be earned. There is also the “open ending,” often employed by Raymond Carver, in which the story is cut off before a moment of epiphany or even a moment of violence (as in “Tell the Women We’re Going”). A few months back, I put a story on my blog in two different posts. My dad read the first post and then told me he liked my story. I explained to him that the story wasn’t finished yet, and he responded that he just assumed it was over because I tend to end my stories abruptly. I was a bit offended, but I also thought this a funny characterization. Honestly, I have to admit that I committed the same crime with a Carver story, thinking it had ended mid-action, even though there was at least another page left of the story I hadn’t noticed. I do appreciate the Carver technique for ending a short story, but I think it is much harder to get away with this in a novel. Another technique, according to Schappell, is the “symmetrical ending.” She warns that writers must be careful with this kind of ending, or any ending that necessitates a lot of cleverness. Since I was participating in NaNoWriMo and challenging myself already, I figured I may as well challenge myself with the symmetrical ending. To be honest, I didn’t pick the ending of my book because this was the type of ending I wanted. I picked it because it felt right to my character’s story. The book opens with my main character receiving a rejection letter from the only MFA program she applied to. The next eight months follow her trying to figure out what to do next. At the risk of giving away the ending before I’ve finished writing it, I’ll say that the action in the last few pages mirror those in the first pages. This ending felt right to me because I wanted to show a character coming full-circle in her life. Endings are different for everyone, and they aren’t easy. I’ll end this post with an embarrassing confession. 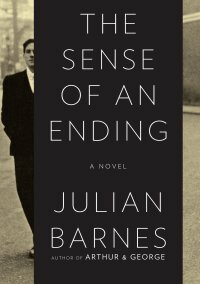 This past summer I read Julian Barnes’s Man Booker Prize winning novel The Sense of an Ending. The book focused a lot on the passing of time and on endings. When I read the end of the book, I honestly wasn’t sure what happened. There was some kind of big reveal, and I’m pretty sure I understand what the plot twist was, but I’m still not entirely sure. I felt embarrassed that I didn’t understand this fancy British book, and I was so stubborn about it that I refused to go back and reread the ending because I thought that would be the same as admitting I didn’t understand it.